This post will relate better to some than others with the subject matter being a local establishment closing; however, the messaging in that Joni song really rings true in our lives today. 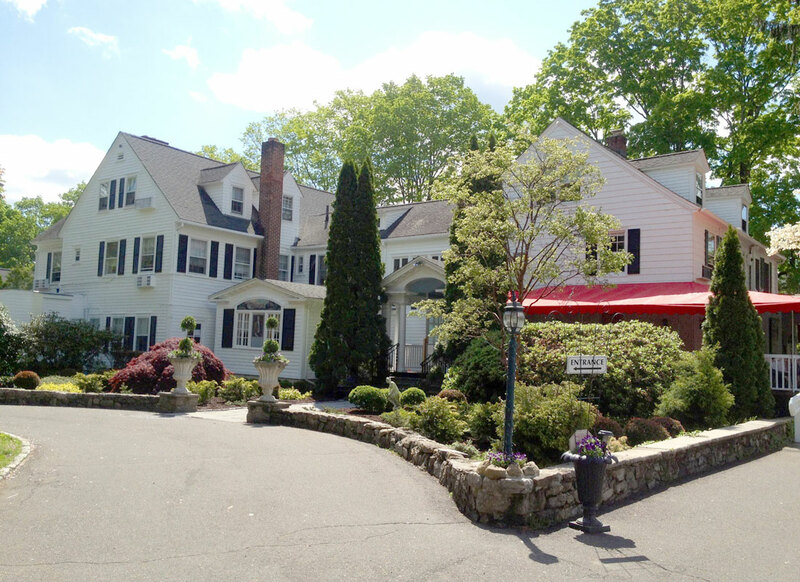 The Roger Sherman Inn located in New Canaan, CT has been a staple in the local restaurant scene for years. Originally in place as early as the 1700’s, this inn and restaurant has survived a few owners and renditions. Its impending final close has inspired some memories of the place. My first Roger Sherman experience was as a child living in Pound Ridge, NY and being dragged to dinner with my parents many a time to enjoy as my mother Nancy described it – “warm plates, cold food.” Those who follow WallyWord, or knew my parents, would know that a great dry Manhattan was what likely drew them to the restaurant initially, and the rest just fell into place. Also, aside from what was Emily Shaw’s in Pound Ridge in those days (now the Inn at Pound Ridge by JG) it was one of more formal dining options in the area. Cold food or not, The Roger Sherman Inn was always the picture of service excellence. 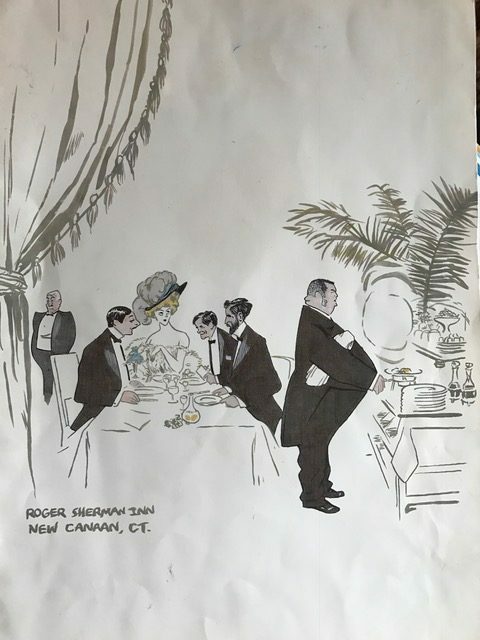 Experienced waiters, crustier than the bread offerings, but dressed formally with a white linen napkin over their arms – would handle tables with impeccable grace and formality. My brother and I were generally well-behaved lads at the table (usually thanks to the threat of a strong-arm from our father), but I was amazed how well the waiters tolerated the Tasmanian devils at other tables with a wink and often unnoticed sarcasm. My opinion over the years was that the food was actually quite good. Despite a varied ownership you could always expect classics like escargots, Dover Sole Meuniere (deboned table-side), Roast Duck, Steak au Poivre, and Rack of Lamb among other dinner staples of the 60’s, 70’s and still to this day. I also think my father would get liver there, and likely one of the few places he would have it, as it was prepared perfectly. Shockingly nobody asked for a bite. My absolute best memory of the Roger Sherman Inn is that it’s where my wife and I had dinner after I’d just asked her to marry me, that meal has lasted 36 years! In fact, the only really poor experience I recall was one Thanksgiving when our children were young and for some reason we decided to go out for Thanksgiving dinner. Holiday meals at restaurants are never a good time really, I should have learned this from my mother who absolutely refused to be taken out on Mother’s Day as restaurants are too crowded, and one is usually stuck with a Prix Fixe menu. Aside from dining, the real appeal, as I got older, was the bar. Despite multiple owners, they have always had a good bartender stationed there over the years, and god knows we’ve logged many hours in the bar, and often times sat in there for dinner. In the early 80’s when I was in magazine publishing, I would hop on the train to New Canaan after a multiple cocktail lunch to head over and meet my wife at the Inn for even more drinks and dinner. Most times there would be a small band or combo playing and sometimes alcohol-inspired dancing. Even if dining somewhere else, there was many a time we’d also drop by the Roger Sherman for after-dinner drinks as well. Now that the reminiscing is done, want to make a point about the end of the Roger Sherman era. I’m not familiar with all the details of the closing, but do know that the Inn will be torn down by a developer who will build a bunch of houses on the property. This is the classic Fairfield County, Connecticut master plan to eliminate history,and replace it with McMansions. Can’t say I blame the owners who probably will get a nice pay-day, and might do it myself if I were in the same position. It just is kind of irksome to someone who has lived in the area for years to see history (and a rare classic restaurant) vanish in that manner. You’re now thinking I sound like someone with a beer gut on the front porch with a beer in his hand complaining about the old days…well you’re half right – but I’m holding a martini. Was the Roger Sherman Inn paradise? Probably not always, but it was a steady place to go that you could count on for great drinks and food, and service – now featuring warm plates. Most importantly, there was a camaraderie in the bar which is indescribable; people of various ages gathering close together, and always in an energizing chatter – whether you knew your neighbor or not. The bottom line was it was a fun place with great cocktails to go at most any age. Over the last few years, did we go every week or every month? Probably not, and maybe that was the issue for the owners, or maybe it was time for the Inn to close and for them to take a breather and cash out. Not surprisingly, the Inn has had a resurgence in the last couple of months with news of the impending close. They keep pushing the final close date off, and are enjoying the “let’s go one last time” mentality of those who love the Roger Sherman. We did just that with friends a couple of weeks ago. Despite growing up or living in different parts of the area, the entire table had their own reminisces, which always included a funny story – it’s that kind of place. I’m here to say a fond farewell to the Roger Sherman Inn! Wally Greene is both an eternal optimist and cynic, a waffling right-winger, a somewhat decent husband and father of three, budding masters swimmer, delusional comedy writer, chocolate lab lover, martini drinker and executive recruiter...not necessarily in that order. What a long strange Tripp it’s been…and continues to be! Hudson’s View – The Meal in the Bowl goes round and round… | Wally's Words on Who’s Wally?